Feeling ill and need to see your doctor. Well here’s a bit of draft helpful advice under the Lansley reform measures. Click on the link above and get a big surprise. Just a simple commissioning guide so the NHS can smoothly run to help meet David Cameron’s ” NHS is in my DNA ” pledge. This was sent to me as part of the big response to the NHS London board diagram of how the NHS will look which I published on Sunday night. I can verify its contents and it comes from @nhs_supporters and the respected and informed Health Service Journal. It makes interesting bedtime reading. This appears to lay out a few guidelines. By the time they have answered all these questions I suspect you might be dead. Notice that GPs will have to send in monthly accounts and that a lot of computer programmes (more waste on IT) will be employed to work out the mix of services. It sound a nightmare to me. But I am sure you will be eternally grateful to the huge cut in bureaucracy needed to answer all these points. Have a good time at your doctor’s surgery. Or alternatively why not e-mail Mr Lansley himself on lansleya@parliament.uk and ask him to go through the process with you. He claims to have spent five years thinking all this up. Pity he didn’t bother to tell the voters at the election. This entry was posted in NHS, Uncategorized, Whitehall and tagged andrew lansley, doctors, GP commissioning, health reforms. Bookmark the permalink. 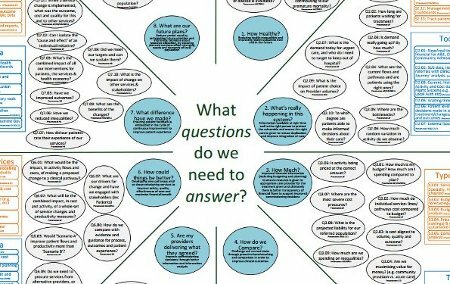 Q3 of the Commissioning Model (How much?) is interesting, since it confirms my suspicions that doctors’ practices, which make up the Commissioning Groups, are going to have to provide regular monthly accounts and forecasts. These will be essential for the Commissioning Groups to know if they will meet budgets and targets. I don’t know much about doctors’ accounts, but I bet most aren’t prepared to the standard which will be expected.